For other uses, see Stole (disambiguation). Violet Latin stole and maniple. The stole is a liturgical vestment of various Christian denominations. It consists of a band of colored cloth, formerly usually of silk, about seven and a half to nine feet long and three to four inches wide, whose ends may be straight or may broaden out. The center of the stole is worn around the back of the neck and the two ends hang down parallel to each other in front, either attached to each other or hanging loose. The stole is almost always decorated in some way, usually with a cross or some other significant religious design. It is often decorated with contrasting galloons (ornamental trim) and fringe is usually applied to the ends of the stole following Numbers 15:38-39. A piece of white linen or lace may be stitched onto the back of the collar as a sweat guard, which can be replaced more cheaply than the stole itself. 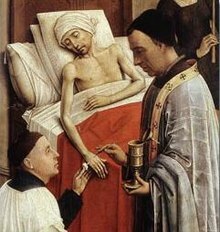 Priest administering Extreme Unction while wearing a narrow, gold stole (Detail of Rogier van der Weyden's The Seven Sacraments ). The word stole derives via the Latin stola, from the Greek στολή (stolē), "garment", originally "array" or "equipment". The stole was originally a kind of shawl that covered the shoulders and fell down in front of the body; on women they were often very large. After being adopted by the Church of Rome around the seventh century (the stole having also been adopted in other locales prior to this), the stole gradually became narrower and started to feature more ornate designs, developing into a mark of dignity. Nowadays, the stole is usually wider and can be made from a wide variety of material. There are many theories as to the "ancestry" of the stole. Some say it came from the tallit (Jewish prayer mantle), because it is very similar to the present usage (as in the minister puts it on when he or she leads in prayer) but this theory is no longer regarded much today. More popular is the theory that the stole originated from a kind of liturgical napkin called an orarium (cf. orarion) very similar to the sudarium. In fact, in many places the stole is called the orarium. Therefore, it is linked to the napkin used by Christ in washing the feet of his disciples, and is a fitting symbol of the yoke of Christ, the yoke of service. The most likely origin for the stole, however, is to be connected with the scarf of office among Imperial officials in the Roman Empire. As members of the clergy became members of the Roman administration (see Constantine I and Christianity) they were granted certain honors, one specifically being a designator of rank within the imperial (and ecclesiastical) hierarchy. The various configurations of the stole (including the pallium or the omophorion) grew out of this usage. The original intent, then was to designate a person as belonging to a particular organization and to denote their rank within their group, a function which the stole continues to perform today. Thus, unlike other liturgical garments which were originally worn by every cleric or layman, the stole was a garment which was specifically restricted to particular classes of people based on occupation. 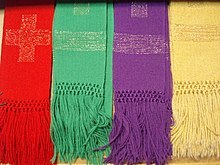 Western stoles woven with a modern design in different liturgical colors. Together with the cincture and the now mostly defunct maniple, the stole symbolizes the bonds and fetters with which Jesus was bound during his Passion; it is usually ornamented with a cross. Another version is that the stole denotes the duty to spread the Word of God. A stole will generally be the liturgical color assigned by the church for the liturgical season or for the particular service. Pope Benedict XVI wearing an embroidered papal stole. In the Latin Catholic tradition the stole is the vestment that marks recipients of Holy Orders. It is conferred at the ordination of a deacon, by which one becomes a member of the clergy after the suppression of the tonsure and minor orders after the Second Vatican Council. A bishop or other priest wears the stole around his neck with the ends hanging down in front, while the deacon places it over his left shoulder and ties it cross-wise at his right side, similar to a sash. Before the reform of the liturgy after the Second Vatican Council, priests who were not bishops were required to cross the stole over the breast (as pictured below), but only at Mass or at other functions at which a chasuble or cope was worn. It is now often worn hanging straight down without being crossed across the breast. The General Instruction of the Roman Missal, which is the liturgical law for the Roman Catholic Church concerning the Mass, no longer makes explicit that a Priest must cross his stole. It states, "the stole is worn by the Priest around his neck and hanging down in front of his chest..." (GIRM §340). Unless there is a law promulgated by a particular diocese or other ordinary, it is left to the priest to interpret what this means. On solemn occasions, the Pope wears, as part of his choir dress, a special stole of state highly decorated and bearing his personal coat of arms. For the celebration of the Mass, the principal celebrant as well as concelebrants wear the stole over the alb but under the chasuble. Likewise, the deacon wears the stole over the alb but under the dalmatic. The stole is also worn over the surplice or alb for the distribution and reception of Holy Communion. The priest or deacon who presides in paraliturgical celebrations, such as the Stations of the Cross, usually wears the stole over the surplice (or alb), and always under the cope. Stole crossed over the chest for a priest. Stole over the left shoulder for a deacon. During the English Reformation, the stole, along with all other sacramental vestments were removed from the Church of England. The Oxford Movement began an interest in pre-Reformation worship, and eventually the stole (along with other vestments) were revived among Anglo-Catholic clergy. Though today, it is not uncommon for a Low Church priest to wear a stole with choir dress, stricter ones may still object to its use, and wear the tippet instead. This re-introduction of the stole continued to cause concern even in the 20th century. During the 1950s, the Bishop of London, William Wand, and the Bishop of Oxford, Kenneth Kirk refused to ordain any candidate to the priesthood who would not wear a stole. Many candidates objected to wearing it because of their theological and traditional allegiances. Finally, Geoffrey Fisher, Archbishop of Canterbury, had to resolve the matter, and instructed that all bishops must not refuse ordination simply because the candidate was unwilling to wear the stole. Today, there is less controversy. When a stole is used in a deacon's ordination, it may be conferred on him or her and worn over the shoulder. At ordination to the priesthood, the newly ordained priest then wears the stole around his or her neck, hanging down in front, either straight down or crossed across the front of the body and secured with the cincture. In Protestant churches, the stole is most often seen as the symbol of ordination and the office of the ministry of Word and Sacrament. Stoles are often given by the congregation (sometimes hand-made or decorated) as a love gift at ordination or at other life milestones. Generally, Protestant clergy wear the stole in the same manner as Catholic priests—around the back of the neck with the ends hanging down the front (though not crossed). Stoles are commonly worn by ordained ministers in Lutheran (see below), Methodist (see below), Presbyterian, United Church of Christ, Christian Church (Disciples of Christ), and other denominations. The clergy of some other Protestant denominations will wear stoles, though normally those in the less liturgical churches will wear either a pulpit robe (with a preaching scarf) or simply a suit during church services. In the Evangelical Lutheran Church in America (ELCA), the Lutheran Church–Missouri Synod (LCMS), and the Independent Evangelical-Lutheran Church (Germany), only pastors wear the stole, as there is only the one order of ordination, that of pastor, in these Lutheran traditions. (The office of bishop for Episcopal polity and president for Congregational Polity is not a separate order of ordination.) Diaconal ministers, the ELCA's equivalent to the deacon, generally do not wear the stole, but sometimes will wear the traditional deacon's stole while performing liturgical functions traditional to the diaconal order. However, in certain Lutheran Churches where people are ordained to the diaconal ministry, such as in the Evangelical Lutheran Church of Finland, wearing a deacon's stole when assisting in a liturgy is an official rule. The Evangelical-Lutheran Church of Sweden clergy follow the use described for Anglican deacons and priests in this article, except the practice of wearing the stole hanging straight down is reserved for bishops (priests wear it crossed over the chest except over a surplice, when no cincture is worn). In the United Methodist Church, ordained deacons wear a stole around the shoulder as in the Anglican and Roman traditions. An ordained elder wears the stole in the same fashion as an Anglican or Roman Catholic priest, with the role of elder being the Methodist equivalent, among other Protestant denominations, to that office. The English word "priest" is in fact derived from the Greek word presbyter, which means "elder". Greek Orthodox deacon wearing "doubled" orarion. 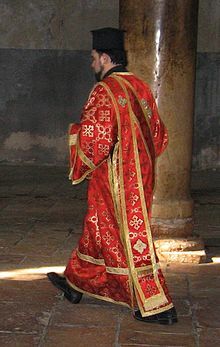 In The Byzantine Rite practice of the Eastern Orthodox and Greek Catholic churches, the stole worn by a deacon is called an orarion, while that worn by a priest or bishop is called an epitrachelion (a bishop additionally wears an omophorion), all similar in meaning and use to the Western stole. In Greek Orthodox practice, the deacon wears a double orarion, meaning it comes over the left arm and under the right. Minor clerics (and in Greek and Melkite traditions the altar servers as well) wear an orarion wrapped around their waist, crossed in back, and then either crossed again in front and tucked under the belted section or not crossed and tucked in (see explanation of subdeacon below). In the Russian Orthodox tradition, the priest may say a special blessing and sprinkle the epitrachelion with holy water before it is worn for the first time. A priest is not permitted to celebrate even the simplest service, even the Daily Office, unless he is wearing the epitrachelion (and in some traditions the epimanikia, or "cuffs", as well). When a member of the faithful goes to Confession, the priest places the edge of his epitrachelion over the head of the penitent as he confesses his sins. After the absolution, the penitent will often kiss the priest's hand and then one of the crosses on the edge of the epitrachelion. At an Orthodox wedding, the priest will have the bridal couple hold the edge of his epitrachelion as he leads them in a procession three times around the Gospel Book, symbolizing the pilgrimage of life. The protodeacon or archdeacon wears the orarion "doubled", i.e., over the left shoulder, under the right arm, and passing again over the left shoulder. The two ends hang down, one in the front and one in the back, coming down almost to the hem of his sticharion (dalmatic). A deacon wears an orarion which simply passes over the left shoulder, the two ends of which hang straight down, one in the front and one in the back, coming down almost to the hem of his sticharion. This is only common in the most traditional Orthodox churches. In many Eastern traditions, the stole is always worn "doubled" unless the deacon in question is wearing only his exorasson (outer cassock) and then it is essentially folded and worn over the left shoulder. The subdeacon wears his orarion over both shoulders, crossed in the back and the front. Those acting as subdeacons (i.e., vested and serving as subdeacons but without having been ordained) wear their orarion crossed only in the back, to show that they do not bear holy orders. Bishops of the Armenian Catholic Church. The wide oriental stole is clearly visible on the Patriarch (center, with crozier and pallium). In the Oriental Orthodox Churches, the priestly stole is very similar to the epitrachelion described above; however, instead of a long narrow strip of fabric that is wrapped around the neck and fastened together, it is often cut out of a single broad piece of cloth that has a hole cut in it for the head to pass through. Sometimes, depending upon the liturgical Rite, it also extends farther down the back. The British Monarch, although not in Holy Orders, is anointed with the oil of Chrism and invested with a stole during the Coronation rite. This stole, made of gold silk, is officially named the Stole Royal or Armilla, and is one of several coronation robes kept overnight in the Jerusalem Chamber of Westminster Abbey before the day of the coronation. The Coronation (which is always in the context of a Eucharist) is an official liturgy of the Church of England; the Archbishop of Canterbury has responsibility for the ceremony and is almost always its presider. A stole is used in the Mandaean religion by the priests during rituals. A stole/scarf/tippet is worn in the Unitarian Universalist religion by some ministers during weekly services. The garment is a symbol of ministry. UU stoles often are adorned with the Unitarian Universalist chalice and come in a wide range of colors. Encyclopædia Britannica, 11th ed., vol. 26, p. 953. ^ Cox, N. (1999). "The Coronation Robes of the Sovereign". Arma. 5 (1): 271–280. Wikimedia Commons has media related to Stoles.